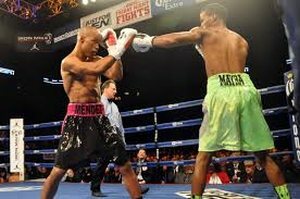 Rances Barthelemy defeats Argenis Mendez for IBF junior lightweight belt, is Michael Farenas next? Barthelemy, an undefeated challenger (20-0, 12 KOs, 1 NC) and the IBF’s number 1 contender, outpointed Mendez with scores of 115 – 111 across the board to become the newest champ of the 130 pound class at the American Airlines Arena in Miami, Florida. After starting strong by jumping on the former champ, Barthelemy, a Cuban who now resides in Miami, maintained his lead by forcing Mendez to the ropes and corners in majority of the rounds with hooks, plenty of jabs and a sticky right hand. He encountered a minor bump in the road, when was warned by referee, Telis Assimenios for a low blow in the 6th and was subsequently deducted 2 points in the 9th and 10th round because of the same infraction. But those 2 points did not matter, as Barthelemy was ahead in all three scorecards at ringside but he had to be mindful of not committing the same offense again in rounds 11 and 12 to avoid getting disqualified. Barthelemy knocked out Mendez in the 2nd round when they first met in Minneapolis, Minnesota on January 3, to briefly hold the belt but the decision was overturned by the Minnesota Department of Labor and Industry to a “No Contest” because the knockout came when the bell ended. This time, the new champ took care of business by beating Mendez convincingly and by avoiding another costly mistake inside the ring which now resulted in his first world title across his waist. This early, Barthelemy has already a challenger to his belt, in hard hitting Michael Farenas of the Philippines who stopped fellow contender Mark Davis last week to earn the right to fight the winner of this championship match. Farenas who is at LAX while waiting for his flight back to the Philippines after spending time with his family in the States after his win last week, was unable to watch the Barthelemy- Mendez fight which was shown on the Fox Sports 1 Network. In a short reply to Philboxing before boarding their plane, Farenas verbalized his hopes of landing a match with the winner of this match in the near future and fulfill his world title dreams. Barring any complications, that fight is up next.